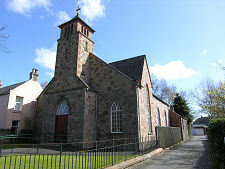 St Boswells sits astride the B6404 as it sets off east from the main A68 Edinburgh to Jedburgh road. Travellers on the A68 actually see very little of it. 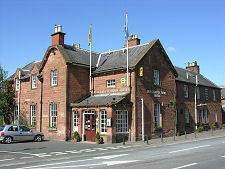 The imposing Buccleuch Arms Hotel lies on the west side of the main road, but the village otherwise stands back from the A68. The broad open space opposite the Buccleuch Arms Hotel is The Green. 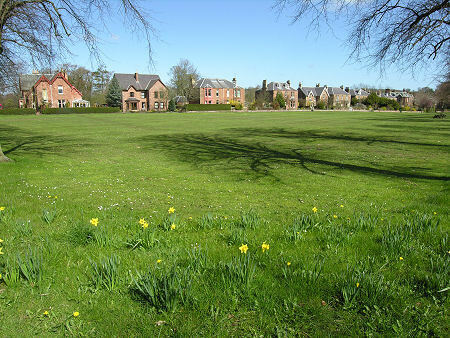 Said to be the largest village green in Scotland, this 40 acre open space gives St Boswells a unique character. 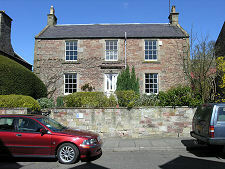 Stretching from the A68 in the west to the bus station in the east it is lined on the north and south by imposing houses. Things were almost very different. In 1849 the Edinburgh & Hawick Railway was built along the Tweed Valley and, according to one story, the initial plan was to build a station on The Green. But the members of the Buccleuch Hunt, whose kennels overlooked The Green, opposed the station. 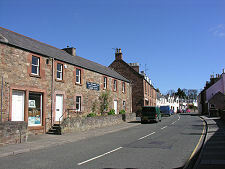 The result was that the railway was routed a little further to the west, and St Boswells station ended up being built a mile to the north west in Newtown: which has since become known as Newtown St Boswells as a result. 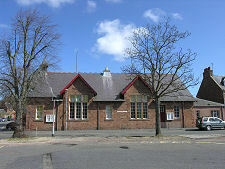 The Green is the venue for an annual fair held each year on July 18th. This dates back to the 1600s and has been held on The Green since 1743. It was originally a sheep fair lasting seven days. It had become a one day event by the 1820s but expanded to include cattle and horses, with over 1000 horses being offered for sale each year in the early 1900s. Today it is often referred to as a horse fair. St Boswells Fair has always been a significant event in Borders life. The author James Hogg declined an invitation to the Coronation of King George IV in 1820 after discovering that travelling to London would mean missing the fair. It wasn't always a complete success, however. In 1853 the fair degenerated into a riot when fights broke out between locals and navvies working on a nearby railway. 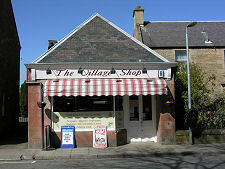 Peace was only restored after the arrival of troops from Edinburgh the following day. St Boswells is a village built largely of a pinkish stone. It was originally called Lessudden "the meadow by the sloping pasture". The name St Boswells has its origins with St Boisil, who was an abbot at Melrose Abbey and who had a medieval church dedicated to him here. 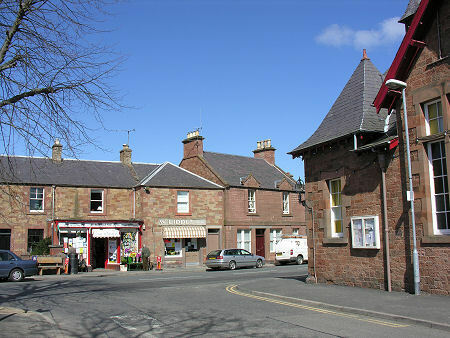 By the 1500s St Boswells was well established and it is recorded that in 1544 there were no fewer than 16 tower houses in or immediately around the village. Sadly this is only recorded in an inventory of property destroyed when an English army razed the village to the ground in that year. 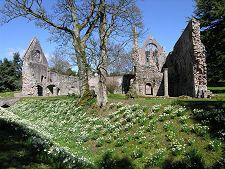 Also suffering at the hands of the same English army was Dryburgh Abbey. This lies less than half a mile in a straight line from St Boswells across the River Tweed, though it is over three miles by road. 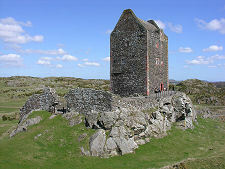 The impressive Smailholm Tower, four miles north east of St Boswells, fared rather better.